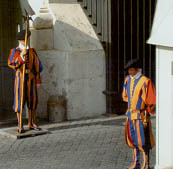 The Swiss Guards were formed at the beginning of the 16th century by Pope Julius II. Since the Swiss were considered to be highly skilled mercenaries who were couragous and loyal, the Pope decided to recruit them to serve as palace guards & bodyguards for the Pope. There first real test came on May 6, 1527. It was the day the Swiss Guards suffered their worse lose to date. On this day 147 Guards displayed great courage as they were slain protecting Pope Clement VII. They were able to prolong the battle against the army of Charles V allowing Pope Clement VII to escape and run for shelter. To commemorate those killed helping to protect Pope Clement VII the Vatican holds this day as the day that all new recruits take their oath to serve and protect the Pope and the Vatican. Once you are a Swiss Guard you must serve a minimum of two years. This is an elite group and the demands placed on each individual at time can be very rigorous. Their primary duties are to secure the papal apartment and Apostolic Palace as well as the four entrances to the Vatican. They are also at the Pope's side when he makes public appearances to ensure his safety and they stand guard during masses and papal audiences. They work around the clock and their shifts can be lenghty and at times irregular. The next time you are in Rome and you happen to see the Swiss Guards at the Vatican you can appreciate the work and dedication they put forth in protecting the Pontiff and the Vatican.